Ana’s first ride on her own horse. This week, I signed Ares over to Anastasija. I’ve resisted actually giving him to her because Anastasija is young. She hasn’t been out of school for long, and that’s a difficult time to get a horse. However, she’s been paying his bills for quite a while now, and the two of them are utterly devoted to each other. 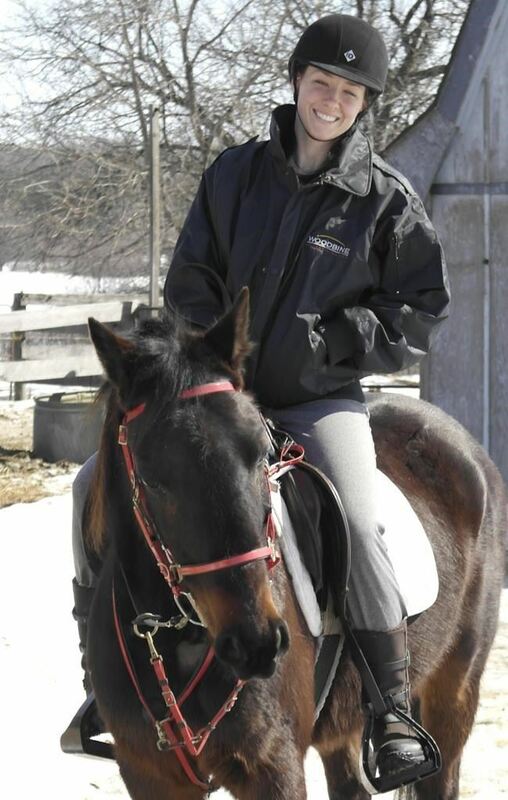 Ares is a Standardbred. He was a difficult horse to break to harness, and eventually was sent to the Mennonites for training. They are very competent, but have no time for neurosis. And Ares is a lily-livered little weeble. So he came out of that with a very well-developed case of learned helplessness. When terrified (which is often), Ares goes into a sort of quivering state of suspended animation. He has never ever bolted or bucked. He does occasionally pop a little half-rear when he is completely overwhelmed. But he would never EVER be deliberately bad. When frightened, he just stands, shaking, awaiting his doom. He’s a small, stocky horse, with a disproportionately large head. And sort of oddly placed, large eyes. Despite his less that elegant appearance standing still, Ares can move. Really move. He was a pacer on the track, and will sometimes pace under saddle. But luckily his pace is very smooth, so that’s not as much of a disadvantage as it is with some pacers. His trot is huge and sweeping. 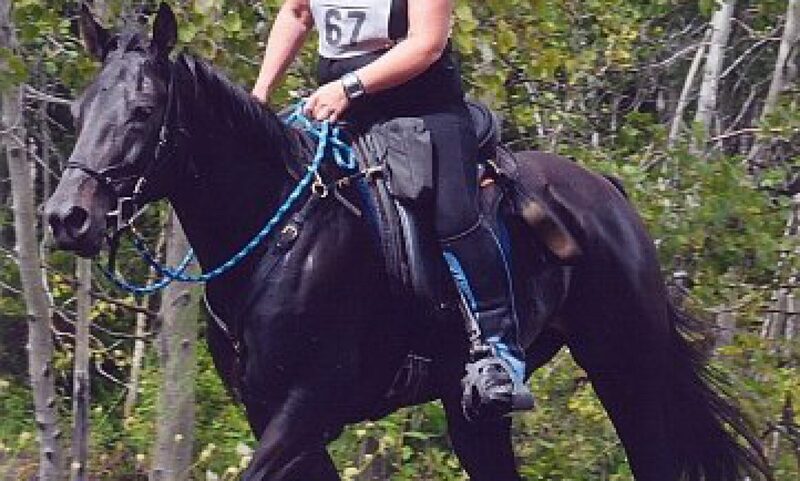 It’s unusual for a Standardbred, but he loves to canter, does it very well, and that is his preferred gait under saddle. He also has a multiplicity of other gaits. None of which I can identify (though someone with more experience with gaited horses would likely know). So. When I first got this guy and started working with him, all I could think was “OMG, who is ever going to want this horse?” I could see some potential in him. But first impressions are important, and Ares doesn’t exactly overwhelm you with his elegance, beauty, or presence. 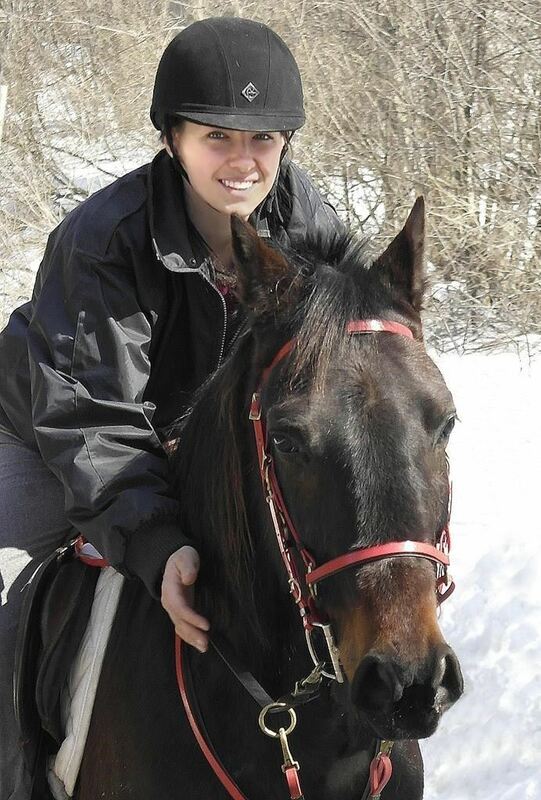 Anastasija is a very athletic and very brave rider. She lacks experience, but she’s still young and unafraid. So I gave her the project of riding Ares in the hope that we could at least turn him into a decent trail horse. Which, surprisingly, he took to very easily. He’s not particularly spooky and enjoys going anywhere that Ana goes. Ares very quickly became devoted to his beloved Ana. He’s like a cartoon horse. Ana goes out to the paddock and calls “Ares! I’m here! !” And that crazy little horse pops his head up and runs to her with little hearts and flowers circling around his ears. He rests his chin on her shoulder and closes his eyes in a swoon. It’s ridiculously sappy. Anastasija thinks he is the most beautiful horse in the world. And when he’s with her, he kind of is. Lining up so Anastasija can mount… yes, from a bucket. I think we all fell off that bucket at least once this winter. The real mounting block is under several feet of snow and ice.